London Hands Off Venezuela Conference – Defend the Bolivarian revolution, respect democracy! 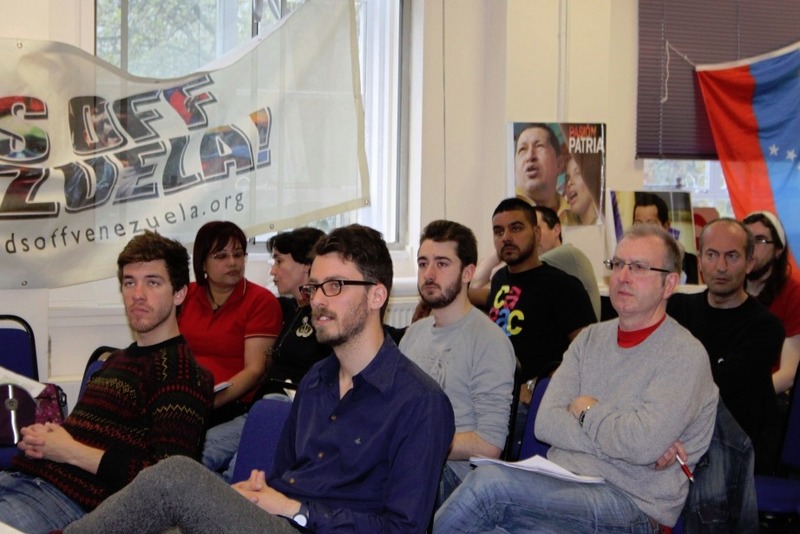 Over 50 activists, trade unionists, youth and Latin American activists, met in London on May 4 to discuss about the legacy of Hugo Chávez and the challenges facing the Bolivarian revolution. The meeting reaffirmed our rejection of the opposition claims of electoral fraud and renewed our commitment to defend the democratically expressed will of the Venezuelan people to elect Nicolás Maduro as president. The Hands Off Venezuela National Conference will be held in London on Saturday 4 May. Come to discuss the legacy of Hugo Chávez, the April 14 presidential election results and the challenges facing the Bolivarian revolution. On Wednesday April 3rd, over 80 people crammed into a classroom at the Université du Québec à Montréal (UQAM) to hear about the revolutionary legacy of Hugo Chávez and the prospects for the revolution moving forward. The outpouring of grief from millions — not just from Venezuelans but from workers all over the world — has demonstrated what Chávez and his ideas meant to the oppressed sectors around the planet.